On a recent trip to Dallas, we had a late-night dinner at the famous Fuel City Tacos. Best tacos in Dallas. Best tacos anywhere. Simple, traditional, and absolutely delicious! This box has picadillo on corn tortillas and chicken on flour. The little cup is hot sauce, not boring ol' mild salsa! They also have a green sauce that makes grown men nearly cry, it's so hot! All of the tacos are topped with chopped cilantro, diced onions, and a lime wedge. Fuel City Tacos isn't a restaurant - it's a kitchen attached to a gas station convenience store. They have an order window inside and an order window outside, and both windows had dozens of people lined up the whole time we were there. The people in line at Fuel City Tacos were young and old, preppies, thugs, hipsters, and at least 3 motorcycle gangs. Clearly these tacos have wide appeal! While you wait for your food, you can go inside the convenience store to get something to drink. There is a new covered porch to the side with rows of picnic tables so that you can eat there if the weather is nice. 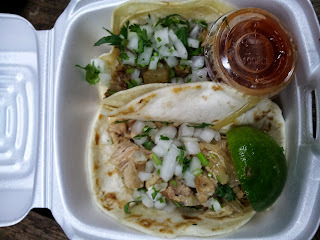 But the best thing about Fuel City Tacos (in my opinion...) is the food cart just down the sidewalk. They sell corn, a Mexican corn dish called Elote. You guys, this stuff is amazing. Absolutely delicious. All the layers melt in together. It is tangy, salty, and spicy - so spicy that you want to stop to take a drink, but so delicious that you don't want to stop eating it for anything! I recreated this deliciousness at home. The amounts are up to you. I found cotija cheese and crema at Kroger (our local grocery chain), in the dairy case near the Parmesan cheese. 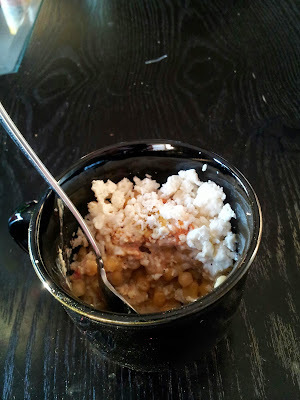 If you can't find cotija, try grated Parmesan or crumbled feta cheese. Disclosure: Though this post contains links, I have not been compensated in any way for writing this post or pulling this information together. That was good stuff. And a fun trip. Makes want to go back for more.